I know, it has been a while since you have heard from me. Recently people have asked why I wasn’t writing about wine anymore… I actually don’t have a great answer as to why the writing stopped. Life happened and blogging got away from me. Which is odd since I am quite opinioned on the matter and love to talk about it So, I am back and if you read it.. I will write! I am a massive fan of Washington Wines. What makes drinking WA wines even more convenient are the hundreds of tasting rooms in my backyard. Woodinville, WA is a close, easy, Saturday afternoon trip to taste some of the states most delicious wines. However, it is not our wine region. To get a sense of our actual wine growing region, you need to leave the comfort of your home, head east of the Cascades and explore. Walla Walla, Washington is one of those perfect wine country weekend get always. Hundreds of tasting rooms/wineries, stunning culinary experiences, inexpensive places to stay and sunny weather (most of the time). I was lucky enough to visit this adorable city back at the end of February. Instead of the 5 hour car ride, I took a quick a 40 minute plane trip from SeaTac Airport. I would highly recommend this mode of transportation if you are low on time. There are inexpensive car rentals right at the Walla Walla airport or just take an uber (at the time of this blog, they had 5 uber drivers)! Either drive or fly, it’s a must visit for wine lovers. Here are the top 4 wineries I recommend. This is by no means my complete list of recommendations. There are hundreds of wineries in Walla Walla and many I adore. This is just a quick glimpse of my top 4 picks from this visit. Otherwise this blog would go on and on….. I chose these 4 based on my experience in the tasting room, attentiveness of the staff and of course the quality of the wines!! My advice, leave the comfort of Woodinville, and see what is really going on in the world of wine. We have so much to offer with Washington wines between Yakima Valley, Red Mountain, Walla Walla, Chelan… and the list goes on. Explore and find your top wineries (and make sure you tell me!). Stay tuned for my next blog when I explain how I have learned to love Prosecco…. 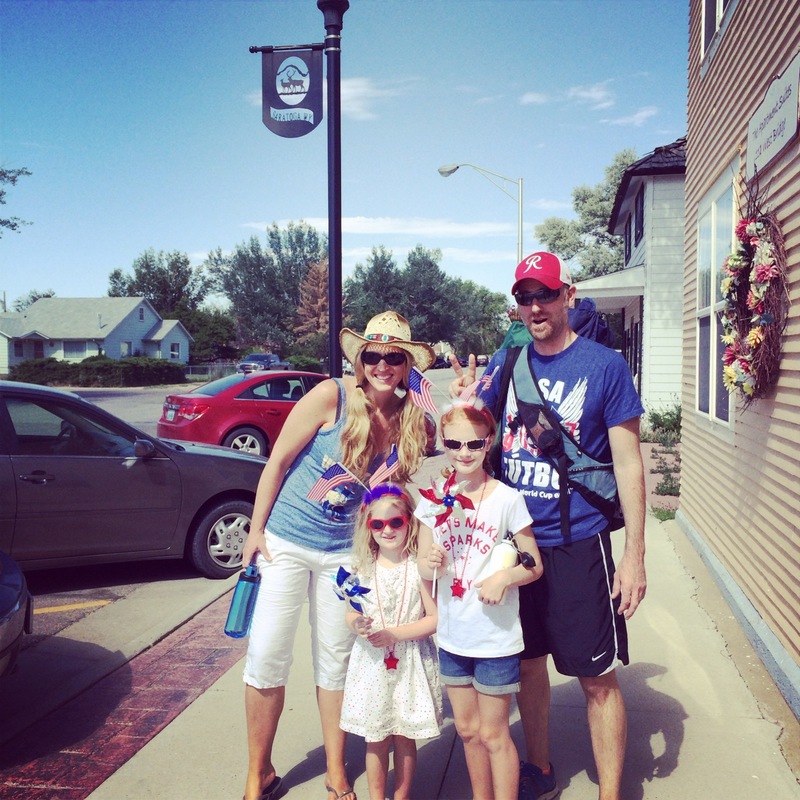 A family fun 4th of July! I am really not complaining though. Summer is my favorite time of the year. I just find it exhausting entertaining (or finding things to entertain) my children all day long. But the perks do outweigh the negatives.. by far. And wine tastes so much better, sitting out on my deck in the sun, watching dad play with the kids so I can unwind. Summer wines can vary for me. I do tend to drink more whites and rosé’s. However, with the long summer nights, we tend to open some amazing reds we have been saving for special occasions. But for the sake of this blog, I am going to give you my top 5 summer wine varietals. This is a fun list to explore. Head into your local wine merchant and ask about this list. They should be able to point out some stellar wines for you (or check out http://www.vinwineseattle.com if you want someone to come and pour a tasting of these varietals for you). 5. Vinho Verde – an inexpensive, Portuguese, high acid, light bodied slightly effervescent white wine. There are many reasons why I love a Vinho Verde. First of all, it’s a low alcohol wine, which is nice for those evenings where you want a glass of something, but don’t want to feel all wobbly. Also because of the low alcohol, it pairs very nicely with loads of summer friendly foods. I personally love a Vinho Verde with Mexican foods, seafood, Asian foods, and anything spicy. The slight bubbles help tone the spiciness down. Check out the Espiral from Trader Joes, only $4.99 and surprisingly delightful! 3. Chardonnay – a medium to full bodied white wine, produced in many parts of the world. I know this wine can often get a bad rep. But this summer I have fallen (hard) for this delicious, rich, white wine. Give me a smooth Chard and I am one happy gal. I do prefer the crisp, mineral, slightly oaky Chardonnays (Chablis) from the Burgundy region of France. I find them slightly complex and enough minerality to keep my attention. However, I have discovered many WA Chardonnays (and a few Chilean) that also keep me interested. My two favorites WA chards at the moment are Revelry Vintners (around $15.99) and Baer Winery’s “Shard” ($24.00). Both are stainless steel, crisp and heavenly. 1. Rosé – really, a no brainer this summer. 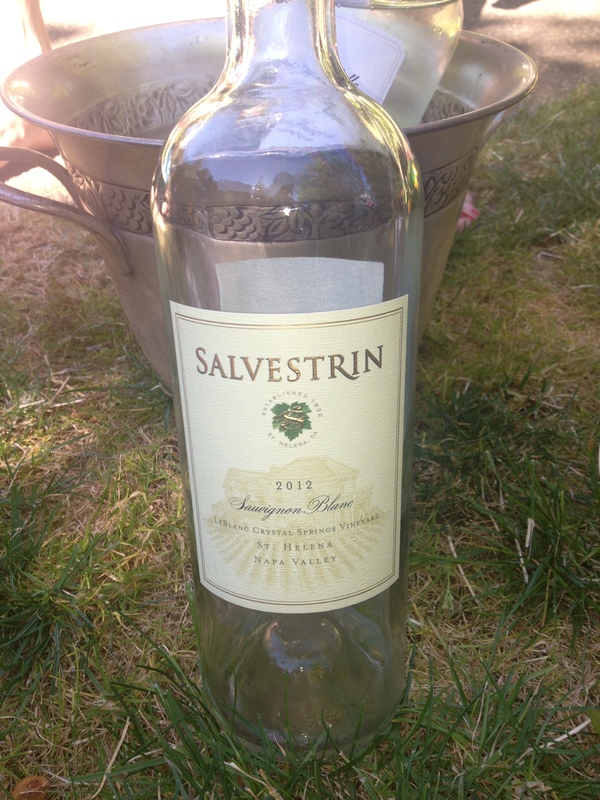 This light to medium bodied wine is perfect for a long summer evening. Almost every region makes a rosé (Rosado in Spain, Rosato in Italy). A rosé goes perfectly with summer meals as well. Charcuterie, grilled fish, pork, salads, shrimp, egg dishes, pretty much anything you would eat in summer. I am a big fan of Provençal rosé’s and Spanish Rosado’s. The AIX rosé from Provence ($14.99) is a standard in our home. I also have fallen in love with Espelt Rosado ($12.99) and the 2013 Red Car rosé from CA ($19.99 and Pinot Noir grapes, delicious). There you have it! A must try wine list to survive the summer heat (or your children). Enjoy exploring this list… and let me know what you try! A successful summer play date! 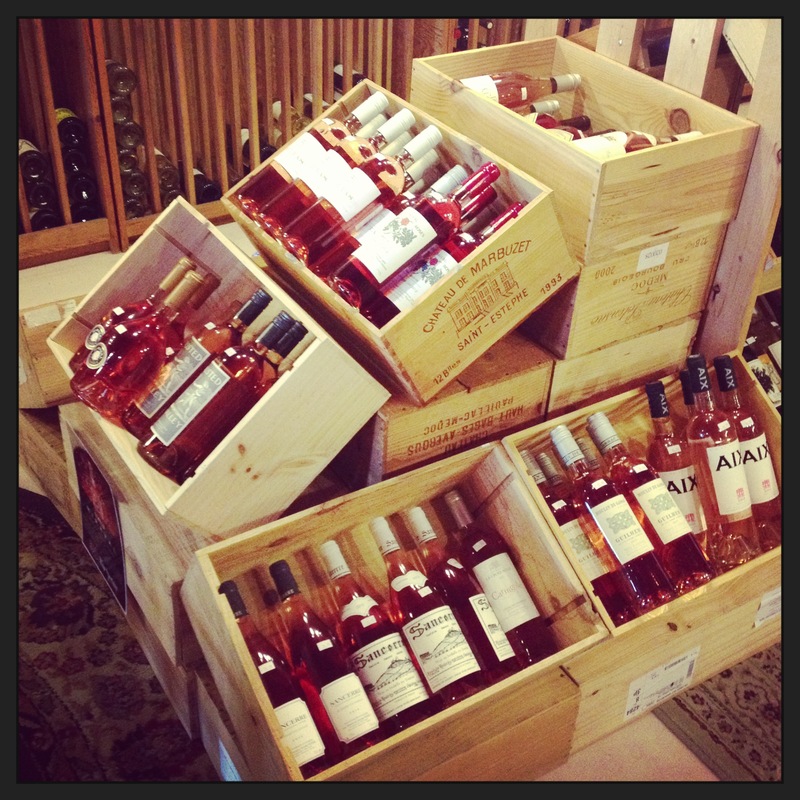 Check out your local wine merchants rosé selection! Check out Vin’s March Specials!! March is filled with all sort of Vin specials!!! 2. Personal wine shopping- Vin Wine and Events can be your personal wine shopper. Let us evaluate your tastes and needs to build your wine cellar or just bring you fun, new wines. No need to feel overwhelmed wine shopping again! This month, For $25.00 plus the cost of wine, Vin will personally hand pick your favorite types of wine and deliver right to you (within a 15 mile radius from Seattle). *6 bottle minimum. If you live more than 15 miles from Seattle, no need to worry. We can deliver to you as well (we just add a small delivery fee). Don’t forget about our Wine Clubs!! We can still get you our February wine club. Cheers to Spring around the corner and new wines to be explored!! 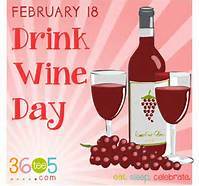 Today is National Drink Wine day. What are you planning on opening up? For me, I am not sure. There are so many choices. I have this Chablis chilling, which sounds crisp and refreshing. However, it’s been a stormy, rainy, cloudy day here in the Pacific Northwest, so a red sounds a little more cozy. But which kind of red? I have one of my favorite WA blends in my cellar, Avennia, waiting for me to open.. but what if I just want one glass? I would hate to waste any of the bottle. It is one of my favorites. Hmm, what about this Sangiovese I have had for a while, that sounds lovely. Although I had Italian food last night.. and a Sangio pairs so well with Italian food (go figure). Maybe I should wait until I have Italian food again…..
See, I have a dilemma. I can’t decide. It’s such a fantastic holiday that I can’t make up my mind which wine to open. Maybe I should wait for my husband to get home to help. Yes, that is what I will do; get a second opinion. But, I do have this Burgundy…. Vin Wine and Events is off and running…. and might I say, I am SO excited!! I have tastings booked for January and into February. My line up is delicious! This journey has been amazing and I cannot wait to see where it takes me. I have a website up for Vin, so take a look when you can. If you are in the Puget Sound region and interested in a tasting or to find out more about Vin, please email me!! While sitting here, creating a Thanksgiving wine list to help my fellow novices, I came across a blog I follow. www.Grapefriend.com has summed up everything for me: “Drink whatever the (beep) you want! !” You are so right!!! I am a believer in that for all meals; drink whatever you like. However I do get asked, often, on what wines to pair with what foods. Now, I have taken the class so I know technically how wines pair with food. But, I am also in the mind set of just drink whatever wine pleases you. Yes, artichokes and asparagus can make your wine taste more acidic/metallic (*hint, you can lesson the hassle by adding additional fat or sweetness to mask the acidity of asparagus and artichokes), but if you love your California Cab and want to drink that with an artichoke pasta, then by all means do it. 1. Bubbles (refer to my past blog) – these would be perfect to start the night off with. However, they can pair nicely with most of the food groups you will be consuming. 2. Chardonnay– I would suggest an unoaked chardonnay. But that could be just me. I am not a fan of overly oaky, buttery chards. A clean, crisp chardonnay will taste brilliantly with anything that has butter, cheese, crab/lobster (if going the unconventional route of Thanksgiving), turkey and vegetables. 3. Riesling– Another versatile wine that will pair nicely with most Thanksgiving menu items. I know it’s an America holiday, but a nice German Spatlese, Austrian Riesling or an Alsatian wine would taste lovely!! If you go with a sweeter Riesling, save that for dessert. (PS German and Austrian Rieslings tend to be lower in alcohol, so you can keep your wits about you if you drink too much of it!). 4. Pinot Noir – This red wine is light (although can be full – bodied) and has a nice complexion of fruit, minerality and alcohol to complement your table. I prefer a Burgundy, however my bank account doesn’t always agree. Check out California (especially from Carneros) and Oregon. Or take a walk on the wild side and grab a New Zealand Pinot Noir. I was pleasantly surprised with the one I tried! 5. Cotes De Rhone- A medium-bodied, French Rhone red that I think would be a hit at your gathering. It has some dark fruit on the palate and moderate tannin structure. Will go nicely with white meat dishes as well as vegetables, cheese and mushrooms (think earthy foods). 6.Beaujolais Nouveau – Ah, yes the coveted Beaujolais. The wine everyone clamors for during this time of year. Yes, pick up a bottle and yes enjoy it with your Thanksgiving meal. Not my favorite, but many of my friends love it. And it seems nostalgic…. 7. Zinfandel – especially a fruity one. Zin’s can actually be a very versatile wine, because of it’s spice, berry and pepper flavors. Most meats pair perfectly with this wine. 8. 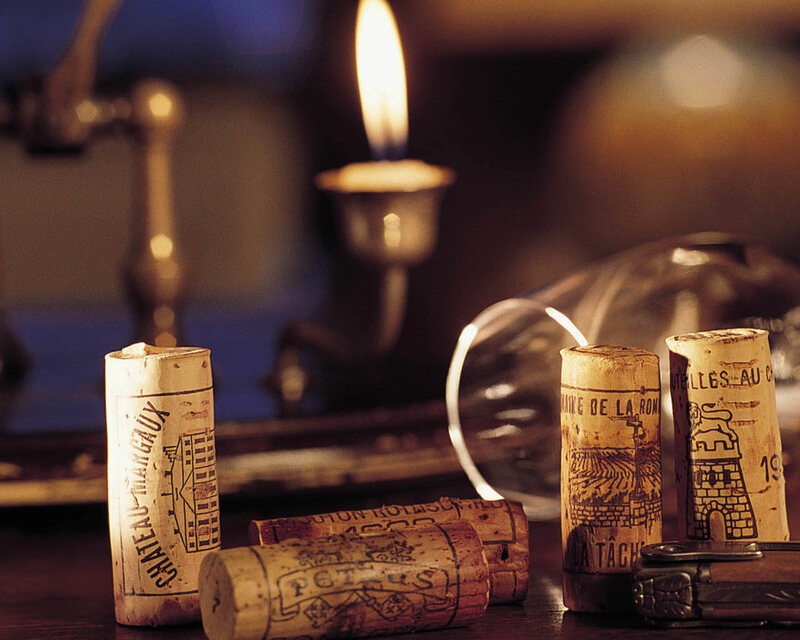 Port, bubbles, Eiswein, Sherry, Muscat – all perfect dessert wines to end your perfect night. For the pumpkin pie – do with Port or Sherry. There you go.. a simple list. Stick with two or three of these wines and you will have a happy crowd (just don’t forget to pick up the beer for your non-wine drinking brother)!! The holidays are fast approaching. And while I would love to continue my summer fantasies, reality has hit. I am sitting here in a coffee shop, wrapped in a scarf, sweater and tall boots; trying to warm up with a latte. Out the window is drizzle and bare trees. In Seattle, this means the holidays are near. So instead of longing for those summer nights, I am buckling down and focusing on one major thing, wines I will be drinking this holiday season. It all starts with Thanksgiving and pairing the perfect wine with this gluttonous holiday. What I love about Thanksgiving is the time I spend with my family and friends; eating, laughing, telling stories and shopping the next day. And of course, I love the wines we will open for this dinner. For the next month, my blogs will focus on wines for the holidays. Those to splurge on, those case-worthy and those that will pair delightfully with all your holiday meals. Let’s start with Champagne, Cava, Prosecco, Sparking wine, bubbles… etc. Whatever you call it, these little effervescence’s of love taste delightful with many holiday meals, particularly Thanksgiving. They are festive, cleanse the palate and versatile. Because we eat a variety of foods on Thanksgiving, Sparkling wine is a great go-to because it tastes delightful with all stages of the meal (even with the pies). Bubbles can vary greatly in price. I am a true believer that you can find a perfect Bubbley bottle for $20-30. While Champagne has the glamorous the reputation, there are many other Sparkling wines that are just as tasty and easier on your wallet. Here are a couple options. **If you need a little refresher course on all the different types bubbles, refer to my past blog on 9/19/2010 – Too much wine? It’s explains the definition of Cava, Champagne, etc. For many this is a splurge, others it is a steal. According to my pocket book, it’s a splurge… but a delicious, smooth, dance in your mouth one at that! This Chardonnay/Pinot Noir Champagne has notes of honeysuckle and pear and is simply decadent; a crowd pleaser. He also makes a Rose Champagne as well, that’s just as amazing. 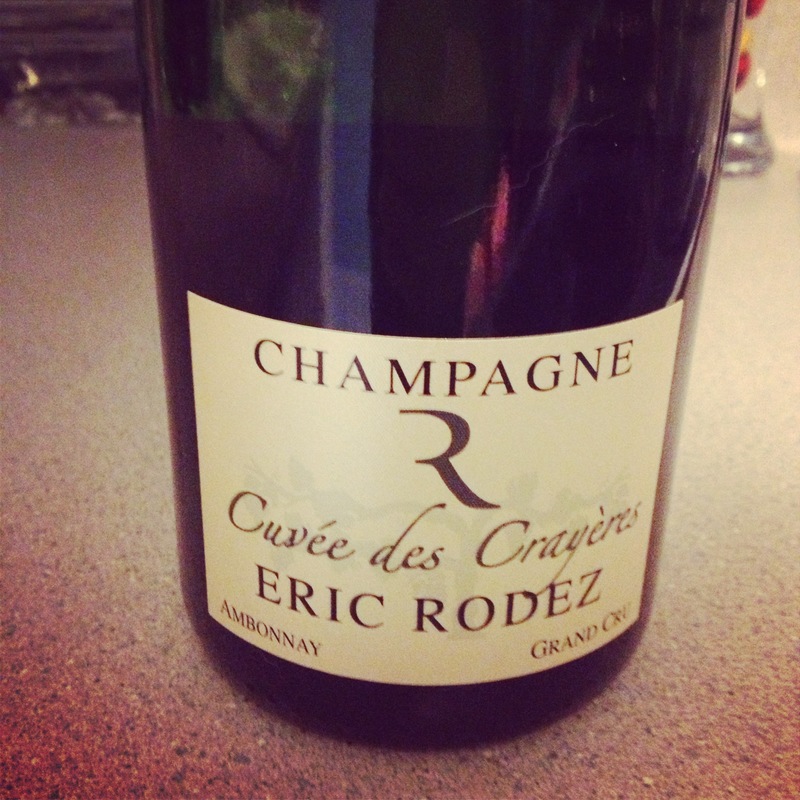 If you are unable to find an Eric Rodez Champagne, ask your local wine shop for other Grower Champagnes. If I am going to throw down the cash for a Champagne, I always search for a Growers Champagne. These Champagnes come from smaller, local vineyards in the region of Champagne, France. They are described more as artisanal wines. The vineyards are usually independently owned around a single village (as opposed to Moet et Chandon who buys grapes throughout the Champagne region). I am a fan of small, local businesses, which is probably why I am pulled towards Growers Champagne. I have talked about Domaine Carneros before and I will say it again, they produce marvelous Sparkling wines. Founded by Taittinger (a Champagne), so they know exactly what they are doing. For the “steal” I would pick up a bottle of their Domaine Carneros Brut Vintage ($28.00). This is one of my standard go-to wines (it helps that I belong to their wine club; I receive a shipment every other month). It is vibrant and fresh; hints of lemon zest, pear and mineral. This wine will add a spark to any holiday meal. I have been able to find this wine in most wine shops and markets. 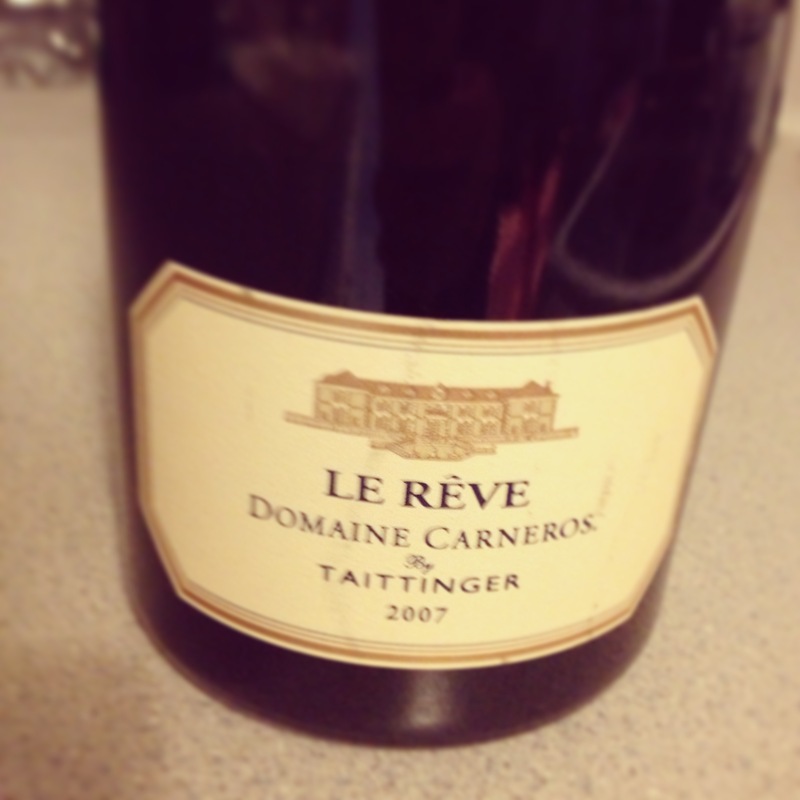 You can also make a purchase through their website http://www.domainecarneros.com/. *This is a picture of their Le Reve, which is a splurge at $99.99. This is my Thanksgiving contribution though. This Blanc de Blanc is made of Chardonnay grapes and aged 6 years before release. This will be my first Le Reve and I am beyond excited! I will let you know if it’s worth the price! If you are concerned about price, look into Prosecco’s and Cava’s. While I often find Prosecco’s slightly sweet on my palate, they are easy on the budget and will likely be a hit with everyone. Just today I saw a great deal on Prosecco at Trader Joes. Cava is also another fantastic option. Whether you splurge for that $50.00-100.00 bottle of Champagne or go for the $9.99 Trader Joe’s Prosecco, Bubbles are the hit wine for Thanksgiving. Wine makes the perfect gift…. It is that time of year!! Parties, gift-giving and cheer. Sometimes (or for me, all the time) it can be overwhelming to try and find the perfect gift. But, I would like to put your mind at ease… I am here to help!!! Let Vin Wine and Events help put together the perfect hostess, employee, mother-in-law, etc. gift for you… wine!! Since I am still patiently waiting for liquor control board to finalize Vin Wine and Events, I cannot ship or sell through the company yet. However, I can still put together a customized wine list for you. If you have some ideas about what your gift receiver enjoys, I can help guide your wine gift for them. Or, if you want to surprise them with something new… I can help as well! Just let me know where you like to shop for wine (Safeway, Costco, The Grape Choice, local gas station, etc.) and I can prepare a list to guide you in your store. Send me an email Carolyn at vinewineseattle@gmail.com and I will make your holiday wine shopping easy! Sometimes there is a winery you need keep an eye on. Meaning, get a bottle or case now, because it’s about to become so popular prices will sky rocket in about 5 years (if you will even be able to get their wine in 5 years). In Washington, we have a wine just like that. A winery whose wine Seattle Magazine has rated “Red Wine of the Year”. A winery which has received Wine Advocate scores of 90 points or higher on all wines. This is Avennia (a Roman name for the city of Avignon- the heart of Old World wine making). 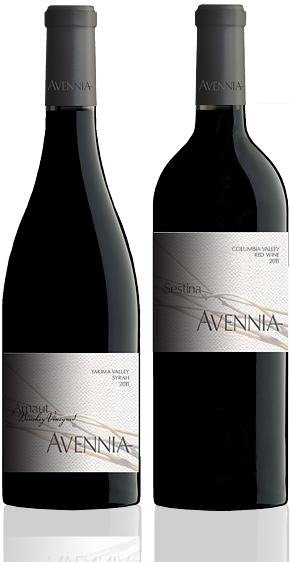 According to Seattle Magazine (August, 2013) “Avennia hopes to make Old World -style with a New World Energy and sense of place.” Marty Taucher (business/marketing side) and Chris Peterson (winemaker) moved into this Avennia adventure together; deciding to make wine from only the highest quality fruit available in Washington. Winemaker/partner Chris Peterson spent 7 years perfecting his wine making skills at DeLille Cellars (out of WA as well). Before that, he was traveling the world and teaching about wine. He knows the industry and knows the fruit (and who to source his fruit from). Seattle Magazine touted him as WineMaker to watch. A huge accolade. However, you should be able to find their wines in most wine shops through the Pacific Northwest. I know The Grape Choice, in Kirkland, is flying through this wine. They may have a couple bottles left of the Sestina and Gravura which is sold out online (unless I get to them first!). Avennia is slowly becoming a “cult” like wine. You are hooked at first sip. With the holidays fast approaching, I am certain most of you have a “wine snob’ on your Christmas list. These wines will definitely impress those “snobs.” Although, you may find yourself not letting the bottle go.. Avennia is a keeper.